This badly-lit picture shows the stuffing as well as the outside. Make sure you put plenty in! This recipe would have been a healthy one if I had stopped at the stuffed pepper stage, but I wanted to see if I could emulate the deep-fried treats you get in Indian sweet shops and takeaways. I succeeded! :) The peppers I had were a little on the large side, which made dipping in the batter and frying somewhat tricky, so they didn't all look perfect, but I got the knack in the end. If you don't want to fry, just stop when the peppers are stuffed and serve with a tomato and mint sauce. A word about the filling: Purists beware because I kind of invented it; it's a sort of cross between my favourite kachori filling (nuts and coconut) and the North Indian stuffing (not potatoes) but with Gujarati spices. The recipe makes enough stuffing for at least 8 large peppers or maybe even 12 or more smaller ones. If you are going the whole way and doing the pakora thing then be sure to choose the long pointed sweet peppers (either green or red is fine) not bell peppers. ... and don't forget the peppers themselves; you'll need anything from 8 to 12 according to size. Plus some oil for deep frying. Find a good basic recipe here. You may wish to substitute some of the gram flour for plain wheat flour, and you may wish to leave out the chilli as the stuffing is quite spicy. First prepare the stuffing; cook the dal in the water. It should become soft and absorb the water, but not be over wet. I'd recommend keeping an eye on it, adding more water a little at a time and only if absolutely necessary. While the dal is cooking, slit open the peppers, leaving the cure little stalks on. Bake them at 200C until soft but not overcooked (avoid charring them). Remove from oven and set aside. When the dal is soft, fry the coconut, peanuts and spices briefly in about a tablespoon of oil and stir in the dal, turmeric and salt. Stuff the peppers by gently pulling them open at the slit, filling them generously and pressing the edges of the slit as close tooether as you can. Be careful, as the peppers will tear easily. Whisk up your pakora batter, heat the oil and deep fry each pepper. If like me you have a small pan, just fry one at a time. Remove and drain when brown and crisp, as shown in the picture. Serve hot with a tomato and mint sauce. or your favourite dipping chutney- tamarind (imli) is also very good with these. *Gujarati dal masala contains: turmeric, star anise, cloves, cinnamon, cardamom, chillies, coriander, fenugreek, cumin, fennel, pepper, mango powder and hing. You could try making your own blend if you can't get hold of the masala. 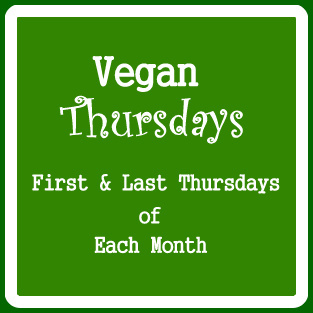 This is a Vegan Thursdays post... just click on this link to find out more. The pakoras look so colourful and tempting. The stuffing is flavourful and healthy. Loved this post. Thanks for sharing. Wow, these look great and perfect for this cold weather... do you have any butternut squash recipes? I have one from my Mum's allotment but have never cooked one before! Yummmm, I see that you used turmeric in the filling ;) what a lovely recipe! I love stuffed veggies, and the stuffed pepper pakoras look so good with the mung dal ;) Happy Vegan Thursdays! Omg, cant ask more, i would love to have this stuffed peppers anytime. I love that you coated them in batter. They look amazing. Desperate to try these now!